We read throughout the Bible about God blessing his people, but most of us don't realize that these blessings are still meant for today--and for us. In this accessible study, pastor and international leader Paul Thangiah connects ancient biblical texts to modern-day life. Exploring Jacob's final blessings over his twelve sons in Genesis and Moses' parting blessings to the twelve tribes in Deuteronomy, Thangiah sheds light on the history of those on whom these blessings were bestowed. With keen insight, he examines the background of each of Jacob's sons, the significance of each name and personal situation, and what the Bible says about his descendants. Then, he shows how each of the twelve tribes saw the fulfillment of both Jacob's and Moses' prophetic blessings. Yet these blessings didn't cease at the end of the Old Testament, says Thangiah, revealing how they were powerfully and ultimately fulfilled in Jesus. 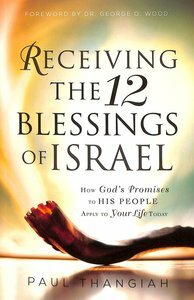 You will be encouraged and inspired to discover how God's promises to his people extend beyond Israel to include all who've been grafted in through Christ--and how you can still enjoy these prophetic blessings today. About "Receiving the 12 Blessings of Israel: How God's Promises to His People Apply to Your Life Today"
Paul Thangiah is the founder and senior pastor of Full Gospel Assembly of God Church in Indiranagar, Bangalore, India. A graduate of Southern Asia Bible College in Bangalore, Thangiah started the church with only three people; today this growing church ministers to more than 25,000 every Sunday in 18 services translated into five languages. It also has numerous ministries that reach around the world. Paul and his wife, Sheba, have been married for thirty years; they have two children and one grandson.